Since 1980, the Federal Trade Commission (FTC) has administered the EnergyGuide labeling program to assist consumers in making informed decisions when purchasing certain home appliances and other energy-using equipment. 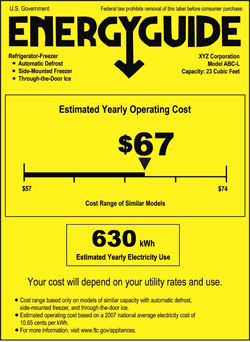 This label gives information on the operating cost and energy use of the appliance. In 2005, the Energy Policy Act called on the FTC to explore more effective designs for the EnergyGuide label. In 2007, with input from ACEEE, a redesigned label was introduced. The redesigned label emphasizes the annual operating cost compared to that of similar products. While ACEEE agrees with some of the changes, ACEEE’s research has shown that most consumers respond best to a categorical “five-star” rating system as opposed to the continuous-scale graphic design currently employed. ACEEE continues to seek out opportunities to enable consumers to more easily make informed purchasing decisions. In 2010, the FTC proposed extending labeling requirements to some consumer electronics, starting with televisions.